Many of us anxiously await the next installment of the Maisie Dobbs series of mysteries set in WWI and the run up to WWII. A gentle, melancholy anti-war tale. The New York Times bestselling author of the Maisie Dobbs series turns her prodigious talents to this World War I standalone novel, a lyrical drama of love struggling to survive in a damaged, fractured world. By July 1914, the ties between Kezia Marchant and Thea Brissenden, friends since girlhood, have become strained—by Thea’s passionate embrace of women’s suffrage, and by the imminent marriage of Kezia to Thea’s brother, Tom, who runs the family farm. When Kezia and Tom wed just a month before war is declared between Britain and Germany, Thea’s gift to Kezia is a book on household management—a veiled criticism of the bride’s prosaic life to come. Yet when Tom enlists to fight for his country and Thea is drawn reluctantly onto the battlefield, the farm becomes Kezia’s responsibility. Each must find a way to endure the ensuing cataclysm and turmoil. As Tom marches to the front lines, and Kezia battles to keep her ordered life from unraveling, they hide their despair in letters and cards filled with stories woven to bring comfort. Even Tom’s fellow soldiers in the trenches enter and find solace in the dream world of Kezia’s mouth-watering, albeit imaginary meals. But will well-intended lies and self-deception be of use when they come face to face with the enemy? 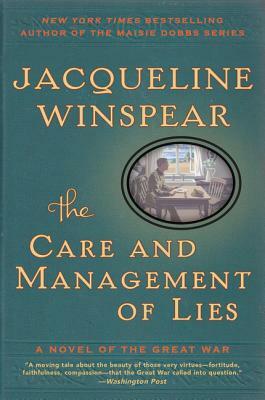 Published to coincide with the centennial of the Great War, The Care and Management of Lies paints a poignant picture of love and friendship strained by the pain of separation and the brutal chaos of battle. Ultimately, it raises profound questions about conflict, belief, and love that echo in our own time.